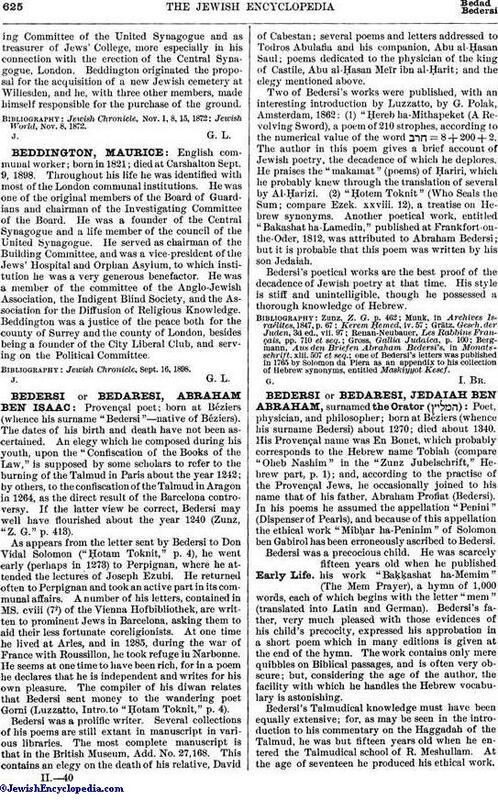 Two of Bedersi's works were published, with an interesting introduction by Luzzatto, by G. Polak, Amsterdam, 1862: (1) "Ḥereb ha-Mithapeket (A Revolving Sword), a poem of 210 strophes, according to the numerical value of the word = 8 + 200 + 2. The author in this poem gives a brief account of Jewish poetry, the decadence of which he deplores. He praises the "makamat" (poems) of Ḥariri, which he probably knew through the translation of several by Al-Ḥarizi. (2) "Ḥotem Toknit" (Who Seals the Sum; compare Ezek. xxviii. 12), a treatise on Hebrew synonyms. Another poetical work, entitled "Bakashat ha-Lamedin," published at Frankfort-on-the-Oder, 1812, was attributed to Abraham Bedersi; but it is probable that this poem was written by his son Jedaiah.